Mushnick brought back some of the usual standards, but added a rant against three-pointers. 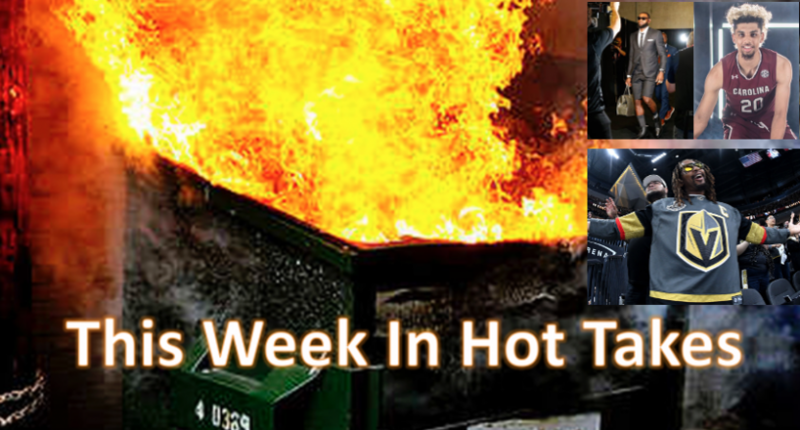 Welcome to another edition of This Week In Hot Takes, this time breaking down the hottest sports media takes from May 25-31. That’s a nice hot take combination. And it’s impressive that Stephen A. is still finding ways to minimize what LeBron’s doing with very little help around him. I can’t believe Rovell thought the SEC should be called when WWF blew up Vince’s limo. I had to hit the 15 second back button about 5 times. That just screams Darren Rovell, first from ignoring the sports context and focusing on the financial implications to completely missing what’s actually going on to trying to get the government involved. What a take. LeBron has gone over the edge with his "heat check," taking wilder and wilder shots, missing again and again, playing no defense. If the Cavs are going to hang in, LEBRON JAMES HAS TO GUARD KEVIN DURANT. Crucial strategic switch. LeBron is turning into James Harden. MOVE THE BALL. GOOD THINGS WILL HAPPEN. LeBron didn't rebound on the missed free throw while he was arguing the call. GSt putback. LeBron: turnover, turnover. THIS GAME WAS SO WINNABLE. Now, looking dim. 2. [Updated.] We initially put Jon Rothstein’s tweet that it was “sad” that Brian Bowen never played a minute in college here, reading that as one of the many comments against basketball players who opt to turn pro. Rothstein reached out to clarify that he meant it was “sad” that a top player like Bowen didn’t get to play thanks to an eligibility scandal, saying “It had absolutely nothing to do with whether or not he should bypass the chance to make money professionally. This was strictly in regards to the notion that a highly touted player with tremendous promise will never get to play college basketball.” That’s a reasonable take, so we’ve removed his hot take points. We apologize for misreading the initial tweet. Sunday’s Cavs-Celtics Game 7 on ESPN included 74 3-point shots. In a 48-minute game, that meant 1.55 3-point attempts every minute. Good Gail Goodrich grief! That didn’t leave a lot of time to play thoughtful basketball. And little of it — fast breaks, give-and-goes, down-low screens, one-touch passing toward off-the-ball movement — was seen. Had it not been a Game 7, it would’ve been another dare to the better sports senses to endure. With 74 3-point shots, the blind notion that this would’ve been a 220-plus points game is understandable. But the final score was Cavs 87, Celts 79. Only 16 of the 74 shots — 22 percent — were successful, which seemed a pitiful waste of talent, not to mention the abandonment of a cherished team sport. Tuesday, prior to Mets-Braves on WOR Radio, new Met Jose Bautista was interviewed by host Wayne Randazzo. I’d never heard Bautista interviewed at length. He humbly spoke of his charitable organization giving “me a chance to reciprocate” for his professional success. Fabulous. But then why would he choose to be known as an excessively immodest, antagonizing, unsportsmanlike, in-yer-face home run bat-flipper? It made no sense. Is one act a con? Both? …It’s time sports’ pandering commissioners demonstrated the courage of their oh-so-hip marketing convictions. If it met with the NHL’s standards that standardized rapper — vulgar, N-wording, women-denigrating — Lil Jon entertain before Game 1 of the Stanley Cup final then was interviewed on NBC during the game, Gary Bettman should be equally eager to recite or display Lil Jon’s written, produced and sold lyrics. If a white NHL player called a black opponent the N-word or spoke lewd sexual degradations of women, Bettman would publicly gnash his teeth then announce an immediate fine and suspension, decrying the inexcusable shame of it all! This is just Mushnick being Mushnick, but it is remarkable that his absurd takes continue to get printed every week.